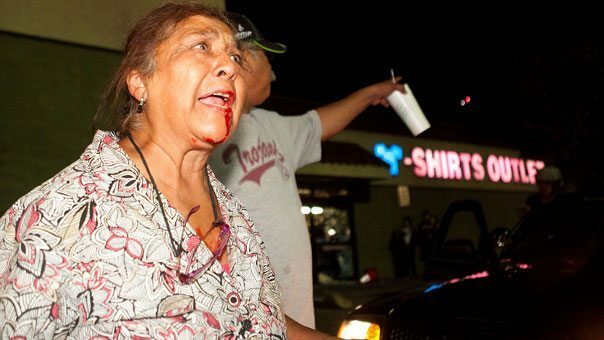 Unrest continued last night – Tuesday, July 24th – in Anaheim, the fourth night in a row – between community residents protesting recent police lethal shootings and law enforcement. 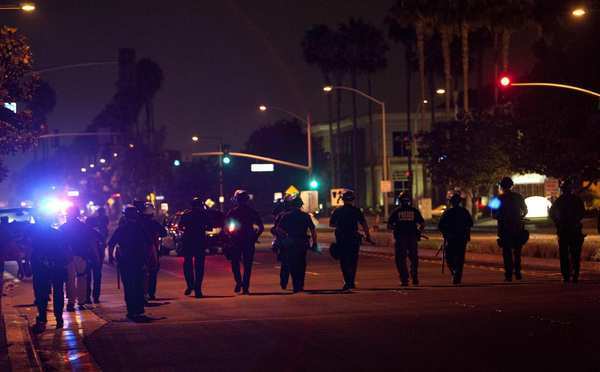 24 arrests were made yesterday and overnight, near a half dozen injuries occurred during the seven hours of conflict Tuesday that ended around 2 a.m.
Anaheim police remained on alert Wednesday. 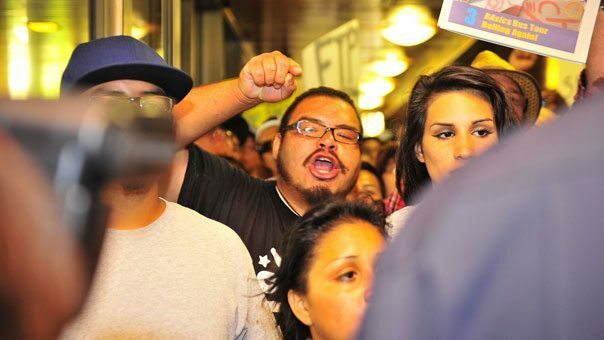 The family of the man fatally shot on Saturday is suing the City and police and a support caravan from San Diego is going up to Anaheim on Sunday, July 29th. 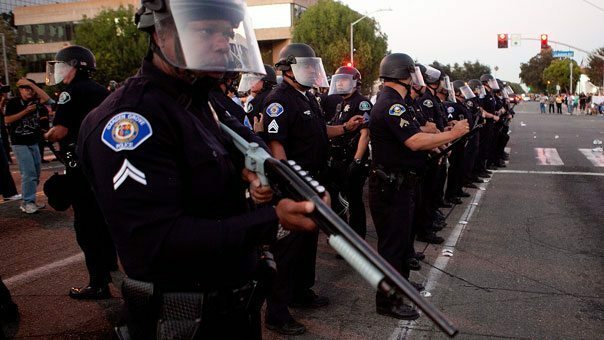 Between 500 and 600 1,000 and 1,200 demonstrators were reported to have carried out protests throughout Tuesday, as hundreds of extra police were brought in to supplement Anaheim’s city police. 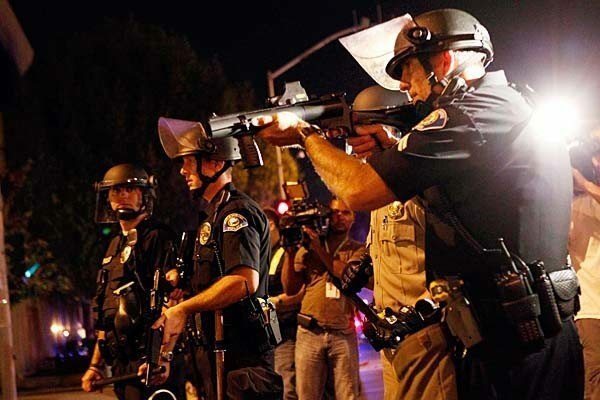 Many of the protests were peaceful, yet police again fired pepper balls and beanbags at unarmed protesters. Some business windows were smashed, rocks were thrown at police, and dumpsters lit on fire. Some of the conflict on Tuesday followed a City Council meeting held during which leaders requested the U.S. attorney’s office to investigate the weekend officer-involved shootings that killed two men. Community residents had packed the City chambers, and an overflow crowd of around a hundred were unable to get inside. Those left outside began chanting and held a rally. More demonstrators showed up, swelling the crowd; in response police began pushing them back. Demonstrators then marched to police headquarters and then returned to City Hall. At around 6:30 pm, police detained a man who they initially said had a gun, but it turned out he didn’t. Police said that’s when rocks began flying. At one point, demonstrators took over an intersection while another group moved to the site of one of the police shootings; police said more rocks were thrown, cars vandalized, including a police patrol car. During the evening hours, small groups ran around in downtown Anaheim, a few trash cans were set on fire, and some windows trashed, including a Starbucks. A gas station reportedly shut down after police said reports came in that some people were filling containers with gas. Police also reported that 20 adults and 4 minors were arrested. At least 5 people were reported to have minor injuries- including a police officer and some members of the media. The family of Manuel Diaz – who was fatally shot on Saturday and was unarmed – has sued the city and the Police Department seeking $50 million in damages. A second fatal shooting by police also occurred over the weekend – making it two for that period. These deaths brought the total number of shootings by police in Anaheim to six so far this year, up from four a year before. Five of the incidents were fatal. And now, of course, the police union has weighed in – as if the police actions needed an official response and they weren’t getting from the elected officials of the City. The police union issued a statement, declaring that both Mexican-American men killed over the weekend were known gang members with criminal records. Also they said Diaz was thought to have a weapon that he was pulling from his waistband. Also the FBI is looking into the incidents to see if they need to conduct a civil rights investigation. On Sunday, July 29, 2012, from 8:30am until 2:00pm, meet at Chicano Park, San Diego to caravan to Anaheim. 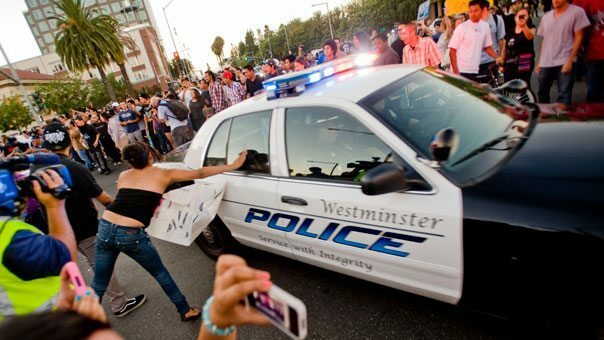 Anaheim Police Department has gotten away with lies, brutality, excessive force, racial profiling, misconduct and MURDER for far too long! APD victims since Aug. 2011- David Raya, Marcel Ceja, Bernie Villegas, Roscoe Cambridge, Gerardo Pineda, Martin Hernandez, Manuel Diaz, Joel Acevedo. JOIN US IN THIS CARAVAN OF SOLIDARITY TO ANAHEIM, CA! 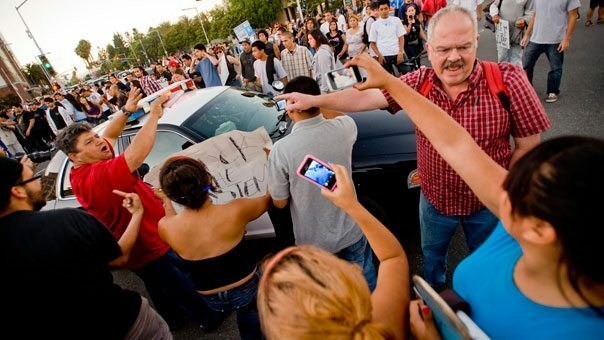 ANAHEIM NO ESTA SOLA!! « Will Carlbad’s Controversial Desalination Plant Get Off the Ground? “Anaheim is 25 miles southeast of Los Angeles, home to the Angels baseball team and world-famous Disneyland. Yet, over the years, Mexican-Americans and Latinos have moved into the city and now make up almost 53% of the population, according to the 2010 census.” Just pointing out that the word “yet” should be replaced by “and.” It makes this article sound racists when you mention world famous sports teams like the Angels and then say “Yet…Latinos have moved into the city” What exactly is that supposed to mean? Those two phrases should not be combined by “yet,” it sounds racist. Not true, Linda. The point being made is that Anaheim is in mainstream culture known as the “home of Disneyland” etc, yet ! below the radar of the news media, things have changed in this city, blah blah blah. You’re being too persnickety.